Our team is ready to welcome you with the best of our region: friendliness. We strive to make your stay as comfortable as possible. Nothing is left to chance to make sure you experience a relaxing and enjoyable stay. 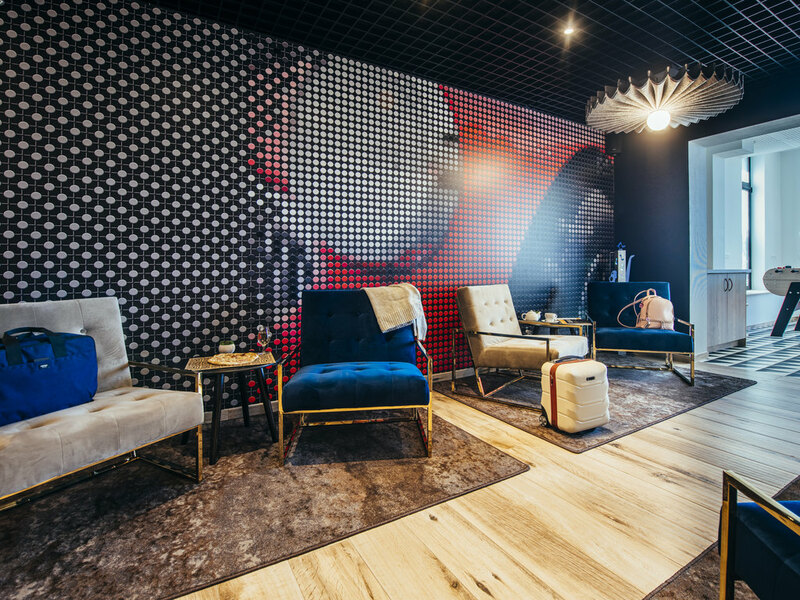 The ibis Haguenau Strasbourg Nord hotel is situated 1.2 miles (2 km) from the historic city center of Haguenau and 20 minutes from Strasbourg and the new designer village at Roppenheim. Close to the Kirrwiller Royal Palace Music Hall, Lalique Museum and Alsatian pottery villages. The hotel has 61 air-conditioned rooms with free WIFI, three of which are specially adapted for people with reduced mobility. Our restaurant and grill "L'Atelier Steakhouse" is open 7 days a week. The hotel is close to the Haguenau Sandlach business area and companies MARS, SIEMENS, SCHAEFFLER INA and SEW-USOCOME. For tourism, the hotel is near Cabaret Kirrwiller, Musée Lalique and the pottery route for Betschdorf and Soufflenheim. For tourism, hotel close to traditional Alsatian villages. Relax in the Baden-Baden thermal baths 40 minutes from the hotel. Close to the historical centre of Haguenau, the vineyard and the natural park of the Vosges du Nord. Visit fortified castles, Music Hall Royal Palace, picturesque villages of Seebach and Hunspach, Schoenenbourg's Maginot line fortifications, pottery villages. I went to Metz visiting my family and as usual I choose the Ibis Style because it's a very good place to stay. Very conveniently located to business like Siemens, Mars etc. The staff was very friendly, though a bit stressed. Breakfast is very good. The rooms are somewhat noisy and the entire object is a bit worn. I didn't receive the usual welcome drink as a Platinum member, but that's not a big deal. Overall well suited if you have business in the area. Often stayed at this hotel. It is clean, has quite good car parking and excellent breakfast served early from 063.0am Just right for travellers. Have stayed several times at this hotel and it is very conveniently located for the long drive from Calais to Switzerland. Good car park, nice restaurant and comfortable rooms. Greeted with a smile, check in very quick, room clean and as described (light in wardrobe was not working but not a big issue). Ate in steak restaurant attached, service there very good too. the location of the hotel fitted in our travel plan. In the future I will probably look for another hotel . Have been here before. This time I got a newly refurbished room, which is a big improvement. Arrived 2 minutes ahead of kitchen closure, but was nevertheless able to order an evening meal. In addition to this, I got plenty of smiles. Fantastic breakfast. But most of all people involved in our stay showed friendly professionalism. Even my iPad forgotten in the room, they took care of :-) . I have been a professional traveler for 35 years, staying at also very expensive hotels accross the world. However this hotel is rated high on my preference list. Will be back next year, same time. Friendly reception, good choice of food for evening. Room was clean but did smell until we ran the taps and shower then it was fine. Expensive bar and drinks. A very satisfactory stay. The breakfast was excellent. Our room overlooked the budget hotel to the rear of our hotel. Barking dogs kept us awake for most of the night, according to reception staff the dogs belonged to clients in the budget hotel who didn’t want to pay €5 to keep their dog in the room with them. We think the cost involved should be included in the room price, I would happily have paid for all of those dogs to be kept enclosed. After a long journey it was the very last thing we expected to happen, it made our stay utterly miserable and we would not stay here again. We have stayed several times at this IBIS as the location is good for an overnight stop when on a trip from the UK to Switzerland. We reserved on line a classic room which has a double bed and divan. We also asked to reserve two places for dinner at the restaurant. We got a basic double room and the restaurant was closed. We had not been informed of the closure. Restaurant closed and no prior warning. We have stayed several times at this IBIS hotel and find it a convenient place to stay when on the long journey between the UK and Switzerland. We had asked to reserve two places for dinner at the restaurant. When we arrived, we were informed that the restaurant was closed. Our room was a simple double room although we had reserved a double room with an extra divan bed. Pleasant quiet hotel. Very friendly staff. There was nobody at the check in desk when I arrived. I found someone who looked for the receptionist and I booked in. When I opened the door to my room, it had not been made up. So I returned to reception and was allocated a different room. When I went to the new room there was an electrician repairing the lighting in the bathroom. So I returned and had a drink at the bar until the room was ready for occupation. I found the restaurant very good and excellent value with good service.